I spent a few days at the brutally hot 1988 EAA Convention (Experimental Aircraft Association) in Oshkosh, Wisconsin. People fly from all over the world to be part of this, and the scale was stunning. Naturally, my bike was a bit of an oddity there, even though there was enough technological overlap to turn a few heads… including mine. It’s kind of a good thing I was broke at the time, or I might have jumped straight from bikes to airplanes and skipped boats! Actually, this has been tempting for years, but I carry too much stuff. For now, I’ll content myself with the transition from one degree of freedom to two… but I’m still always on the edge of being seduced by flying. When computer whiz Steve Roberts became tired of living in suburbia, he sold his car, home and possessions and looked for a new place to run his life. What he found was a 250-pound bicycle, on which he has lived for the past five years, traveling across the country and running his small business. His journey brought him to the Experimental Aircraft Association Convention this past weekend. Roberts, who calls himself a high-tech nomad, works as an electronics consultant and freelance writer while he bikes across America in his portable office and home. 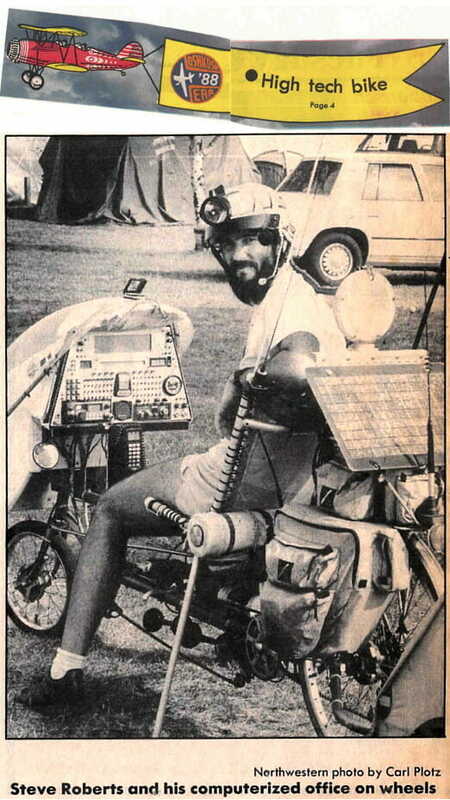 The 54-gear bicycle, which is equipped with such things as five computers, a security system, a ham radio, pressurized water, two solar panels and a speech synthesizer, is both his home and his business. Traveling beside him for the last 6,000 miles is his friend, Maggie Victor, who joined him three weeks after they met each other two years ago. Her reason to go, she said, was being in love. His reason for joining the road, he said, was restlessness. As he travels, the 35-year-old Roberts says that he writes stories and sends them from his bike through the use of the cellular phone and computer equipment. He said he designed much of the the equipment, including a computer which allows him to write while his bicycle is still moving. By programing stories in Binary, a computer language dealing with numbers, the computer allows him to input stories with one hand while the bike travels at speed of 10 to 15 miles per hour. He has another portable computer, he said, which allows him to do the detailed editing later. In the five years he has lived on two wheels, he said he has covered more than 16,000 miles from coast to coast. “It doesn’t matter where I am,” Roberts said. “Location is irrelevant. With my equipment, I can be in touch with anyone electronically. It is easy to deal with information from a bike, but as soon as you start dealing with products it gets hard.” Part of his job is also promotional, he said. After contacting some electronics companies, he said he convinced them to donate equipment to be tested, improved and designed by him. Nothing tests the quality of a product better, he said, than being used on the road, especially on a bicycle. “I use their equipment in an unusual environment,” he said. “But from a personal standpoint, it is a way to play with the latest and greatest toys. My job is basically to have fun and to tell people about it. My life is business, but so much of it is fun that I don’t notice.” He has also written three books, his latest being Computing Across America. There is no shortage of interesting stories for him to write either, he said. 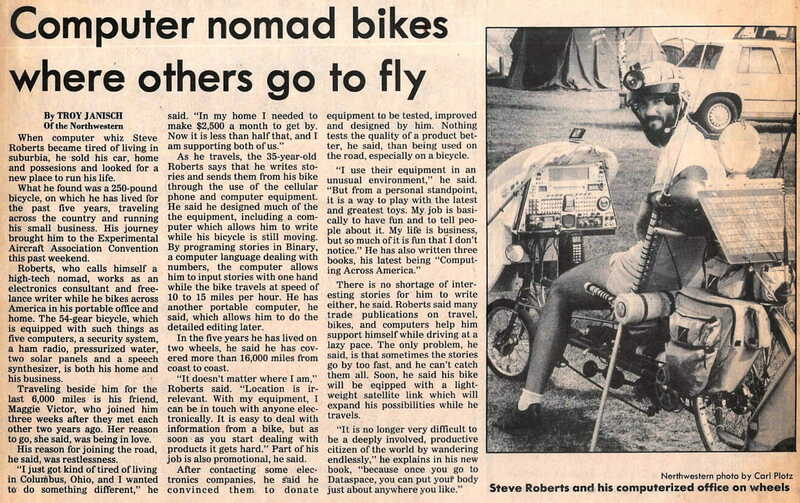 Roberts said many trade publications on travel, bikes, and computers help him support himself while driving at a lazy pace. The only problem, he said, is that sometimes the stories go by too fast, and he can’t catch them all. Soon, he said his bike will be eqipped with a light-weight satellite link which will expand his possibilities while he travels.